This article discusses some of the most convenient ways a store owner can pack and even ship his products to the customers. It will cover WooCommerce UPS Shipping plugin and its advanced features using which a store owner can simplify the product packaging and shipping from his end. There are a lot of options when it comes to WooCommerce shipping. However, this quantity decreases when we focus on the needs of the store owners. The reason being, most of the plugins focus very well on the customer’s needs. These plugins get the shipping quotes accurately based on the shipping carrier. Some even calculate shipping rates based on various conditions. Yet, there seems to be a major thing that is missing, especially on the part of a store owner. Peter’s Issue – Shipping rates at back-office..! So the first thing is clear from the above text, Peter wants the shipping quote to display at the back-office the same way it shows on the cart and checkout page. This way he will be sure of how much he will be paying for which shipping service. However, he also discusses another important issue that store owners face. According to Peter, his back office should show the shipping rates for the valid shipping services between two places. For example, an international must show only international shipping services along with the shipping rate. And no domestic shipping method must be visible. These are some serious problems that almost every other WooCommerce store owner faces. Now, let’s check how can Peter get rid of this issue. WooCommerce UPS Shipping is one of the best shipping plugins. 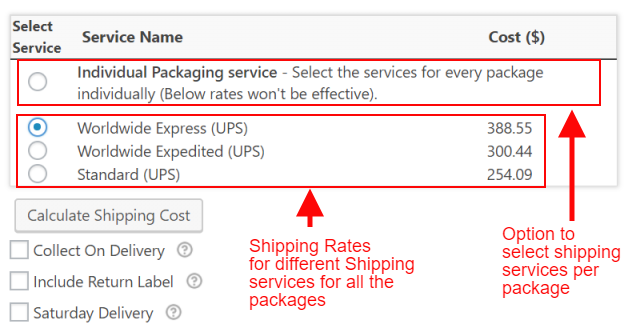 In fact, the plugin features the built-in ability to display shipping rates on the WooCommerce Order’s page. The plugin returns the shipping services available between the source and the destination, along with the real-time quote from UPS. The image below shows all the available shipping services between California (USA) and Ontario (Canada). The shipping rates shown in the above image are for all the packages combined. If Peter chooses to ship the packages with different shipping service, he needs to select the Individual Packaging Service option. By selecting this option, the shipping rates shown on the order page won’t be applicable. This way Peter can choose either to ship the packages together using a single shipping service with the rates shown or he can choose separate shipping service from the available ones, for each package. Now let’s see what issues Lucy is facing. Lucy’s dilemma – How to pack products in packages..? Lucy deals with furniture and ships it across Canada. However, Lucy has some issues while packing her products. Lucy requires a mechanism where along with the shipping label, she should get the list of contents for each of her packages. This will make it very easy for her to pack her products accurately. Since now we know her issue, let’s try to resolve it using UPS Shipping plugin. Lucy’s case can be easily resolved with the help of WooCommerce UPS Shipping plugin. The plugin has a built-in mechanism that shows the content of a package as soon as the store owner generates the shipping label. The following image shows how Lucy will be able to see the content of the package that has to be shipped. The image clearly shows the contents of the package. Using this information, Lucy can easily pack her products within the weight and dimensional limits of the box. Also, she will be able to apply the shipping label accurately based on the weight specified on the shipping label. So, this was all about how WooCommerce store owners can easily optimize the process of packaging and shipping from their back-office, using WooCommerce UPS Shipping plugin. This article covers WooCommerce UPS Shipping plugin with Print Label. With the help of this plugin, WooCommerce store owners can now get more flexible options when it comes to selecting shipping methods. Moreover, it also deals with product packing. In this article, we have discussed how WooCommerce UPS Shipping plugin allows store owners to get shipping rates in the back-office, for their convenience. Apart from that, this plugin also shows the contents of the packages to make it easier for store owners to pack products in boxes. If you have any suggestions regarding the content of this article, please feel free to share your view in the comment section below. Or if your store needs a similar shipping solution, we would be happy to discuss the possibilities of the solution that this article covers.